Pew asked a variant of this question: “How often, if ever, do you go shooting or to a gun range.” I’m not sure what the clause “or to a gun range” is supposed to specify beyond going shooting. 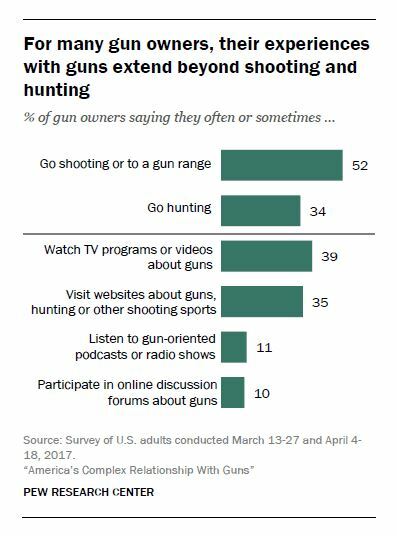 In any event, Of people who guns, 52 to 53 percent say they go shooting or go to a range sometimes or often. Source: Pew Research Center, America’s Complex Relationship with Guns (22 June 2017), p. 34. Interestingly, 18% of gun owners never go shooting or to a gun range. 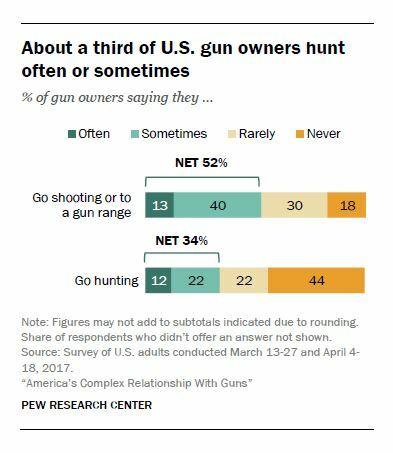 I wonder if some part of this group are hunting-only-hunters who distinguish in their mind between “shooting” and “hunting”? Also, although collectors immediately come to mind, some part of this group is probably also those who buy a gun for self-defense then stick it in their nightstand without ever shooting it and hope for the best. How important is being a gun owner to your overall identity? Pew asked a question I did not think of in terms of centrality, since it speaks more to self-identity than behavior, but which is nonetheless an interesting one: How important is being a gun owner to your overall identity? For half of gun owners, being a gun owner is somewhat or very important to their overall identity. The other half of gun owners say not too important or not important at all. 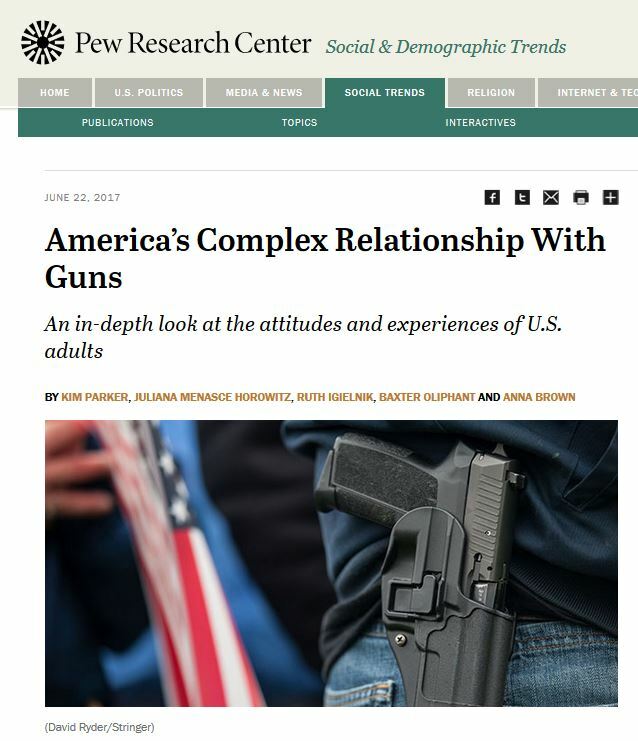 Also interesting is Pew’s observation, “Roughly equal shares of men and women who own guns say being a gun owner is very important to their identity” (p. 31). So, fewer women own guns than men, but for those who do, being a gun owner is as central to their identities as it is to men’s identities. Web 2.0/3.0 participation in on-line gun forums, Tweeting about guns, etc. Consumption of gun-related old media: magazines, radio programs (“Tom Gresham’s Gun Talk”), and TV programs (Outdoor Channel and Sportsmans Channel, especially). I recommended alot of ways people can be actively involved in gun culture, and Pew did ask about many of them. I won’t report all their results here, there are different levels of engagement with different gun culture media, with TV programs and at the top (39% of gun owners often or sometimes watch) and online discussions forums at the bottom (just 10% of gun owners often or sometimes participate. Source: Pew Research Center, America’s Complex Relationship with Guns (22 June 2017), p. 29. Someone who had more time and access to this data than I do could definitely do some interesting work identifying more fully people who are more central to gun culture in terms of the breadth and depth of their involvement, and those who are more peripheral. Not everyone who happens to own a gun is an active participant in American gun culture, but there is a significant minority of the population of the United States today that is. Understanding them has been central to my mission here for the past 5 years and this Pew Research Center survey (limitations and all) adds some welcome insights into Americans and their guns. Tags: Data, Hunting, Pew Research Center. Bookmark the permalink. Interesting question because I might answer that one “no”- I think of forums as being like warriortalk and pistol-forum or Reddit. I view my personal ownership of firearms as central to my status as an American Citizen. I base that on my education in History/Polysci many years ago at then HPC and personal reading on what the writers of the Constitution had to say about the Second Amendment. It is interesting to see how many people identify gun owning and citizenship – something those who want to control guns don’t fully appreciate (i.e., they either don’t see it, or they see it and don’t respect it).